Thank you for making the rest of the summer “waterporrf” for Caleb and his brothers. Man, we were absolutely stoked when we found out we could get one of these things. While in Ohio on vacation with his grandma, our 4 yr old broke his elbow. Not just a break straight across like normal, but a corner break that doesn’t like to heal. He is now in his second cast and he broke it June 16. We were going to get a big blow up water slide but because he couldn’t use it, we decided not too. We went the whole month of July with not allowing our other 2 children play in the water because it wasn’t fair that Caleb couldn’t either. When we went to his orthopedic Dr. in Chapel Hill, we came across one of your brochures and said we HAD to have one. So one Saturday, we decided to head to Wilmington to get one and then go to the beach. Well, your store wasn’t open so we drove all around town till we found Sea Shore Drug that was STILL open at 4pm and was able to buy one. Thank you for making the rest of the summer “waterporrf” for Caleb and his brothers. 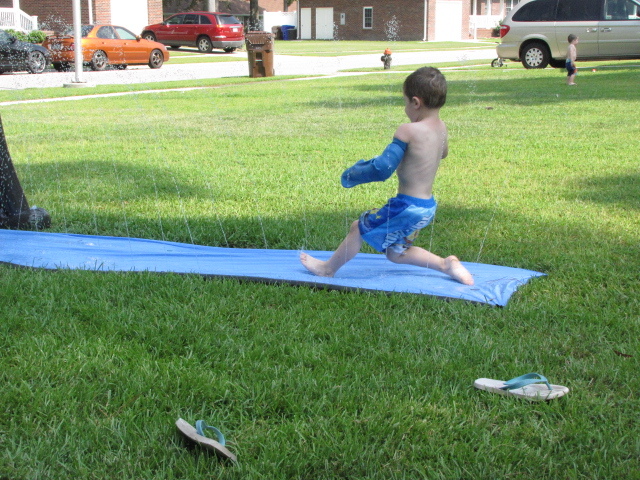 (and letting me off the hook for being mean) Here is Caleb on the Slip and Slide.